During this Christmas period, DCSH offered a festive 3-Course Menu + Gifts @$88++ per person. For starters, you can choose between Arkham City's X'Mad Minestrone Soup or Star of Wonder (Woman) Salad. The soup is very subtle, slightly tangy from the tomatoes and you can clearly taste each ingredients such as celery, cabbage, carrot and potato. In line with the theme of the cafe, the sliced potatoes and carrots comes with the shape of Batman Logo. The parmesan cheese crackers, springs a slight surprise in the soup flavours. The salad serving looks generous. Instead of typical mini cube croutons, the salad came with toasted bread in the shape of star. You can find pomegranate arils, raisins, sliced almond and dried cranberries accompanied the mesclun salad. The combination of balsamic vinegar and red wine vinegar, gave the dressing the sweetness needed to lift up the salad. Little Devil and I personally feel that the salad is the crowd pleaser, especially with so much high antioxidant ingredients in it. For Mains, you can choose between Batman's Dark Knight Burger, Deluxe Edition or Aquaman “The Sea King of Atlantis” Lobster Tail. The half lobster is pretty huge in size, it is springy, tasty and goes well with the lobster bisque sauce. The vegetables are done just right, boiled then coated with lemon butter. A good choice for a seafood lover. Our pick are the deluxe edition of the burger. Served on black charcoal bun, mustard mayo with Wagyu Beef Patties, Foie Gras, Avocado and Chilli Jam. Ok, I am officially drooling again when I writing this review. The patties is thick and juicy, while the foie gras and avocado just melts in your mouth. Yum Yum Burgergasm!! The fries on the side was double fried, so it is crisp on the outside and moist inside for a longer period of time. Warning, the size of serving is pretty huge, so it will be enough to share with your loved ones. There is only one choice of dessert, which is Superman Winter Solstice-Tude. Mixed berries tartlet with icing sugar. You can find the combination of strawberries and blackberries on the tart and sliced kiwi fruit on the side. Though it looks aesthetically pleasing, it does not deliver in terms of taste. For each person ordering the Festive Season Special, you will each received Trexi Batman or Superman (Value at $29.90 each) and a Hero Cape of Batman or Superman (Value at $29.90 each). If you count this in, it is truly worth to visit DC Comics Super Heroes Cafe during this period. During our visit here, we also sampled their Flaming Firestorm's Wings ($10.90 for 6 pcs/ $18.90 for 12 pcs). A unique version of chicken wings, where it combines the prawn paste marinate with bbq sauce. It is crispy, juicy and succulent and well seasoned. Meanwhile the bbq sauce is not spicy at all and is suitable for all ages. When you order drinks here, such as their Strawberry Supergirl ($9.90) it come with a Super cup, which has a cape on its own. Pretty Cool right. We also tried some of their other desserts such as their Rainbow Chocolate cake ($9.90 per slice) and Lemon Meringue Pie ($7.90). Let just say that the Superheroes were to busy fighting crime, they did not pay attention to the desserts. Unless you really in a need to get your fix of cakes, we suggest you give it a pass. 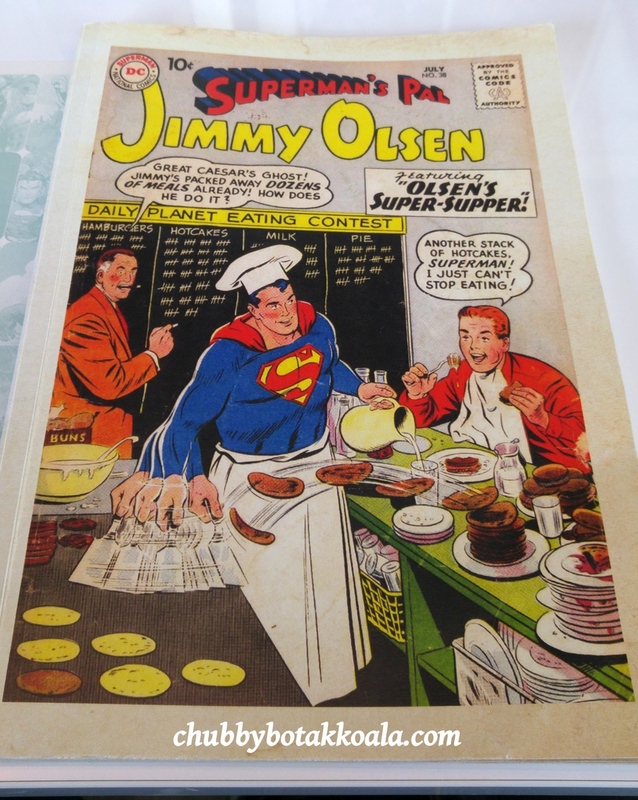 Overall, dining at DC Comics Super Heroes Cafe will provide you with a sense of dining with your DC Comic Superheroes. The entrée, small bites and main menu are good and delivery on flavours. The drinks are creative and we totally loved the presentation. So DC Comics fans or those who want to get to know DC Comics Characters, give this place a try. Cheers and Merry Christmas. Thank you very much to DC Comics Super Heroes Cafe and H3(Cube) for the tasting invitation. Eve & New Year – 31 Dec 2015 & 01 Jan 2016.